When people think of construction building materials, the first thing that comes to their mind would be cement. Cement can be used as raw materials to make fiber cement board, concrete slabs, AAC blocks，precast concrete, AAC panel......Those building materials is widely used in building constructions for many years. 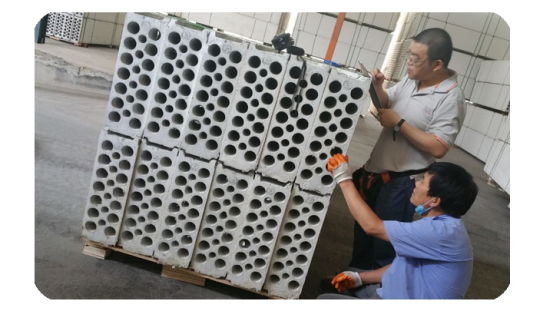 Unlike those traditional building materials, Onekin green wall panel is a new green building materials, it uses precast technology,has high quality and outstanding performance but not as known as concrete panels. To ensure a high quality of Onekin green wall products, we have our own research and development Center in Chengdu. 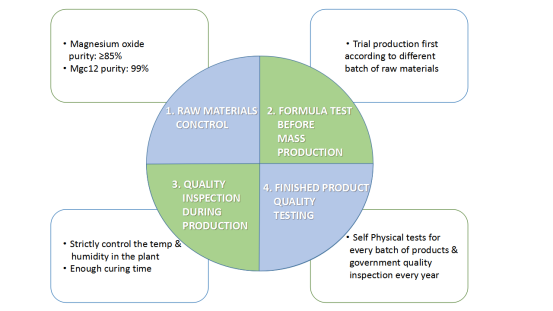 As to Onekin quality control system, it includes Pre-production Inspection for raw materials, Trial production firstly，In-Process Quality Control, Finished product quality testing, and Container Loading Supervision. We have a stringent system of trace ability and quality control to make our production efficient and provide feedback to the product development process. Different from concrete panels, magnesium oxide panel’s main raw materials is not cement but magnesium oxide, and it is not just mix all raw materials together --- the raw materials of mgo panels will react chemically with each other, and this is the reason why it can be high strength and lightweight at the same time. Since our panels are using the chemical reaction for strength, the quality of raw materials is very important. Onekin chemical engineer would produce some small samples to check, test every batch of raw materials to adjust the formula accordingly. 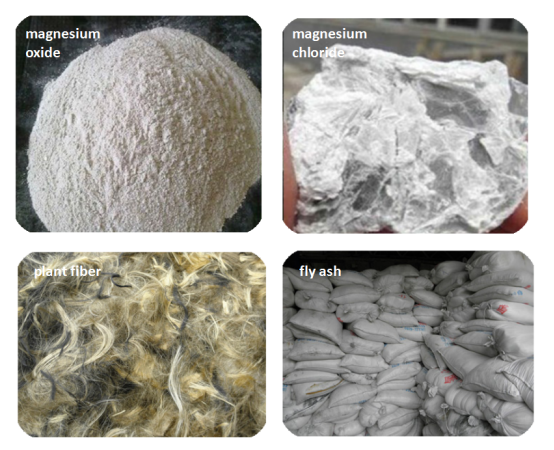 Magnesium oxide --- components, content, activity of Magnesium oxide, loss on burning, granularity; purity at least 85%. Magnesium chloride--- content, other chemical composition; purity at least 99%. Fiber glass mesh (for mgo board) --- layer, size of fiber mesh, mass per unit area, breaking force, alkali resistance of retention rate. As the craftsmanship is different from concrete panels, our wall panel has different formula. To produce high quality concrete alternative to our customers. We have strict formula test before mass production. To pursuing customer by delivering world-class quality products, we have trial production first according to different batch of raw materials. Onekin on site engineer execute strictly control of stoichiometric proportions and take notes for future reference. According to weather condition, the temperature and humidity will be adjusted to provide an optimum environment for finishing chemical reaction of raw materials. 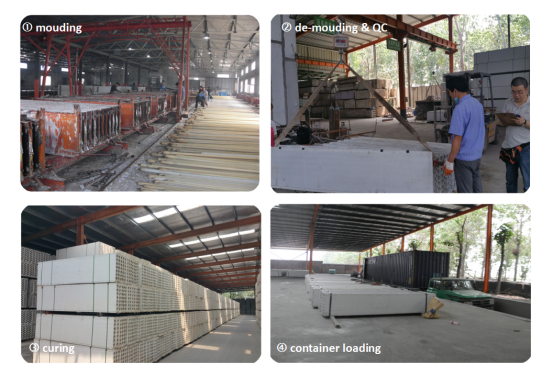 What’s more, our staffs would monitor in real time to make sure the high quality and smoothness surface of wall panel. And we always leave enough curing time to our products, so that it can has high strength by fully chemical reaction. Except the standard sized wall panel and board, dimensions of our products also can be customized, we can provide just the size you wanta. After the product is produced, our skilled workers will inspect the product’s size and weight, to see if it meet the requirement. When compared with other similar materials, Onekin green mgo wall panels offer a number of benefits: it has grade A1 fireproof performance, better than concrete panels and fiber cement boards; completely green materials and no asbestos, thermal insulation and heat resistant like foam concrete and the most important part is that our panel is much lighter than cement or concrete panels, can be easy to install and easy to decorate, and lower the total cost of the project.